MS Word is the most popular documenting application, but the most commonly needed features like numbering the pages is where many get confused that’s because when before setting page numbers there’s a need to separate the sections which need different page numbering.In this tutorial I’ll show you how this is done. Let take a situation to show its use.,If you are writing a report where you would be needing to have different page numbers from index, abstract, etc and from introduction to conclusion you want to start numbering again and in the last, after conclusion starts appendix., where you want to start page numbers again. 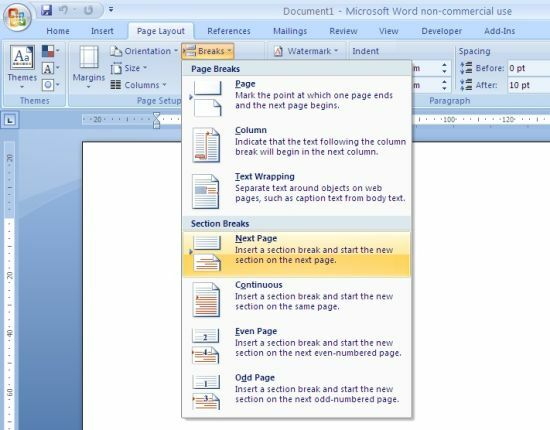 To create new page numbering,place the cursor on the end of the page after which you need to start new page numbering and next navigate to PageLayout Tab –> Breaks in PageSetup and select NextPage under Section Break. Once you finish doing this now start page numbering from the page after which you created the section break.